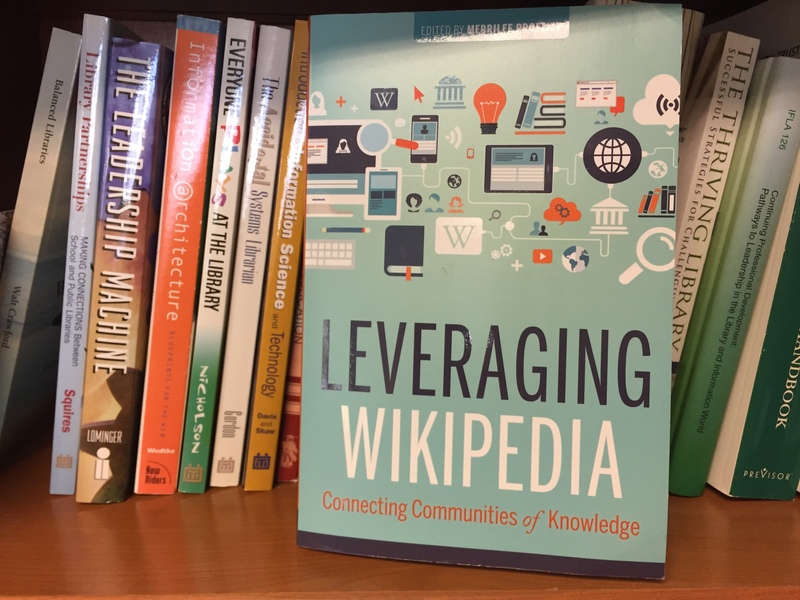 “Leveraging Wikipedia: Connecting Communities of Knowledge” is a new book published by the American Library Association that highlights the myriad connections between Wikimedia projects and libraries. Edited by OCLC Research’s Merrilee Proffitt, the book contains 15 chapters highlighting ways librarians and Wikimedia projects have been intertwined since Wikipedia’s founding in 2001. “Leveraging Wikipedia: Connecting Communities of Knowledge.” Image by Monika Sengul-Jones. I was honored to contribute a chapter to the book highlighting the work Wiki Education and the broader Wikipedia Education Program has done to connect academia and Wikipedia. Several other Wiki Education friends and collaborators offer their insight throughout the book, making it an interesting read for any university librarian looking to get more involved in Wikipedia, Wikidata, or Wikimedia Commons — or just interested in how programs work in the Wikipedia space. Andrew Lih’s chapter on the history of collaborations between “GLAM institutions” — Galleries, Libraries, Archives, and Museums — and the Wikimedia projects offers a helpful overview for both newcomers and experienced Wikimedians alike. Lih explains the mutual interests of both Wikimedians and GLAM institutions, and highlights several collaborations, including an explanation of the Wikipedia in Residence model adopted by several institutions. A chapter written by Alex Stinson and Jason Evans is filled with case studies and tips for collaborations. With practical insight and broad overviews of a number of ways Wikimedians and librarians can collaborate — including references to both Wiki Education’s Classroom Program and Visiting Scholars Program — the chapter is a must-read for any librarian looking to survey the options of where to get started with Wikipedia. West Virginia University Wikipedian in Residence Kelly Doyle authors a great chapter on the equity gaps related to gender in Wikipedia, and how she’s worked over the last two years to help close those through on-campus support from the library at WVU. She talks about her work to train librarians on campus to edit Wikipedia as well as projects to engage students in service learning through editing Wikipedia, always with a focus on closing the gender equity gaps on Wikipedia. Lily Todorinova and Yu-Hung Lin offer a chapter that showcases a study Rutgers University’s library did to measure students’ use of Wikipedia as well as their work with the Visiting Scholars Program. Students, they found, generally view Wikipedia as a “reliable gateway to information”, and that a rubric would be helpful for students to assess the source material in Wikipedia. They also felt encouraged to continue collaborating with Wikipedia based on their experiences in the Visiting Scholars program. Sara Snyder’s chapter offers a good how-to for edit-a-thons, a collaborative editing event that many university librarians are eager to host at their institution. While Wiki Education does not support these events, this chapter provides great guidelines for those interested. Mairelys Lemus-Rojas and Lydia Pintscher’s chapter on Wikidata offers an overview of the newest Wikimedia project, and one that has the potential to be of great interest to many university librarians. Wiki Education is in the planning stages for a pilot program next year to work with Wikidata, and this chapter offers many helpful insights into the open structured data repository. In a chapter on semantic web identity, Kenning Arlitsch and Justin Shanks write about how they engaged with Wikipedia and Wikidata to improve the availability of information about the Montana State University Library and two other campus groups. This chapter will be of interest to librarians interested in their institution’s own web presence. Finally, Merrilee Proffitt’s chapter offers an inspirational closing statement on why all librarians should become Wikimedians, and how welcoming and collaborative the broader community of people are who help facilitate the relationships between Wikipedia and libraries. As someone who’s been involved in the Wikimedia movement since 2010, I can attest to Merrilee’s encouragement to join us: This particular intersection of groups offers fruitful collaborations for both libraries and Wikimedians. And my thanks to Merrilee for including my chapter about Wiki Education’s work in the book! The book is available from the ALA store. Encourage your university library to add it to their collection today. Image: File:Leveraging-Wikipedia-book.jpg, ALA, CC BY 2.5, via Wikimedia Commons.